The Tattoo takes place each year in August. Although there are one or more performances each night for nearly a month, the performances sell out. 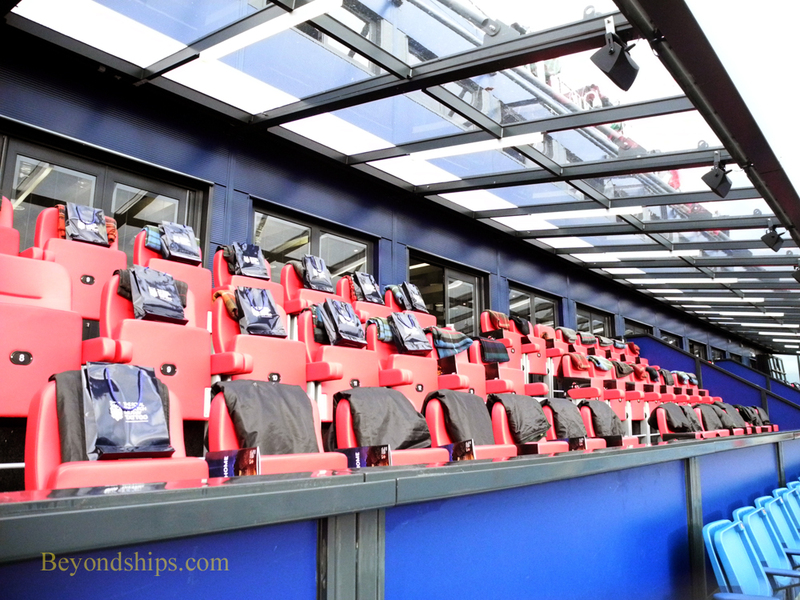 Each ticket entitles the holder to a specific seat in the stadium. Nonetheless, as noted earlier a long line to get in forms well before each show that winds its way around the streets leading to the Castle. It is patrolled by young people working for the Tattoo backed up discreetly by police and uniformed military personnel. There are three types of tickets. The least expensive are on either side of the stadium. Seats in the sections facing the Castle are more expensive. Even more expensive are seats in a VIP section located at the top of the seats facing the Castle. In addition to entitling these ticket holders to champagne and other goodies, this section offers protection from the weather. The Tattoo goes on regardless of the weather. In fact, since it began in 1950, no performance has been canceled. Thus, since it has been known to rain in Scotland, it is best to come prepared. Along the same lines, it is a good idea to dress warmly because it can become cool even on an August night. Above left: People making their way up the hill towards the Castle. 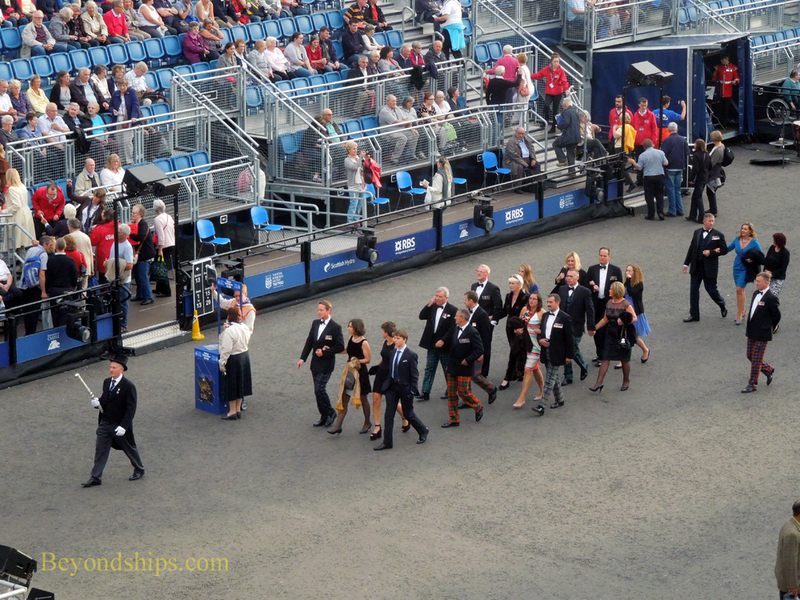 Below: A procession of VIPs. I attended the Tattoo on a shore excursion from one of the Princess Cruises ships. 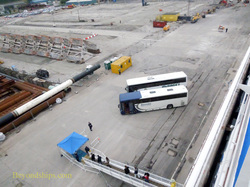 Another ship that was in port with us also had coaches going to the Tattoo. The excursion that I was on was well-organized. 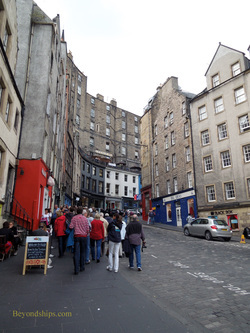 A coach took us from the cruise port at Rosyth to a street just below the Castle. A guide then took us up the hill to where the line was forming. She explained the mechanics of getting into the stadium and how to return to the coach after the performance. She also said that she and her colleagues would be posted at various landmarks along the route back to the coach to make sure people did not become lost. This turned out to be quite valuable as there was a sea of humanity milling chaotically around the streets after the performance. Even though the shore excursion was more expensive than attending the Tattoo independently, I was glad that I went on the excursion after hearing a horror story from a group of people from our ship who had gone independently. They were able to purchase tickets online for the performance. (You usually have to do so months in advance). And they had no problem getting to the performance. However, after the performance there were no taxis to be found. Eventually, they were able to get to Waverly Railroad Station and then to the station at Inverkeithing. However, by then the shuttle to the ship had stopped running. Somehow they made it back to the cruise port by 3 a.m., some five hours after the shore excursion had returned. The lesson is that if you are going to the Tattoo independently, arrange your return travel beforehand.